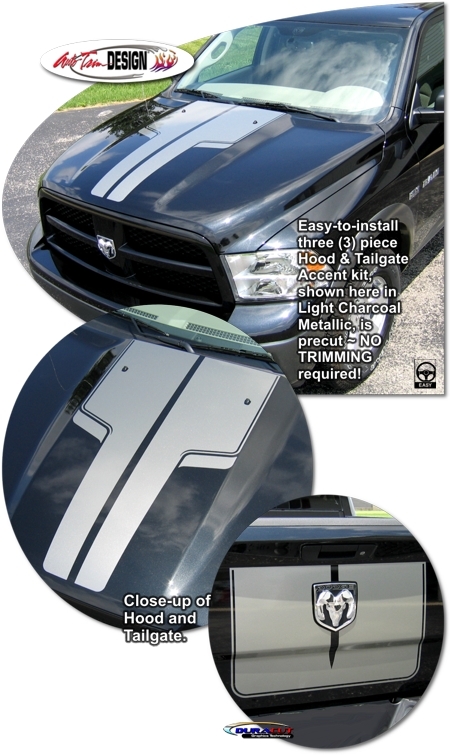 Make your '09-Current Dodge Ram Truck unique with this Hood and Tailgate Accent Graphic kit. This easy-to-install kit is packaged as a set of three (3) pieces with a classic 1/4" (6.35mm) pinstripe at the outside perimeter as shown. They're PRECUT and ready to install in a wide variety of colors - NO TRIMMING required! Kit is specifically made for the '09-Current Dodge Ram Truck factory hood and rear tailgate areas and will not fit any other vehicle. Due to structural rib supports found on the top of the Ram Truck's roof area, we do not offer a Roof piece.